Taiwanese container transportation and shipping company Evergreen Marine Corp. is expanding its operations into Central and South America this year following the recent opening of four new agency offices in the region. "In view of the growth potential in Latin American trade, Evergreen Line is continuing to establish its own offices at main service locations in the region. The move will strengthen the effectiveness of the line’s operations, improve its capability to react to market opportunities, optimize the efficiency of its network routing and enhance its competitiveness in the area," the Taiwanese freight company said. Evergreen Line has just opened its own agency in Colombia following the establishments of other offices in Peru, Chile and Mexico over the past few months. In setting up these offices Evergreen confirms its continued commitment to serving the trade and economy of Latin American west coast region. The dedicated personnel at these locations will have responsibility for local marketing and sales, customer service, shipping documentation, ground transport and port operations. In order to expand the container transport options for its customers in Far East – Latin American west coast trade, Evergreen has teamed up with partners to add two more trans-pacific services; these are in addition to the two currently operated by Evergreen. As a result the range of direct ports of call on offer via, the now four weekly services, has been expanded to Pusan (South Korea), Qingdao and Xiamen (China) and, in Latin America, Ensenada (Mexico) and Lirquen (Chile). 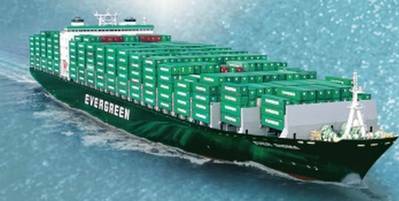 "Evergreen Line is committed to providing efficient shipping transportation throughout its global service network. In addition to an on-going fleet renewal program, the line has also expanded its regional operations in recent years," it said. As of today, Evergreen Line has established its own agency offices in more than 30 countries around the world in the belief that this commitment will provide superior transport services for its customers.